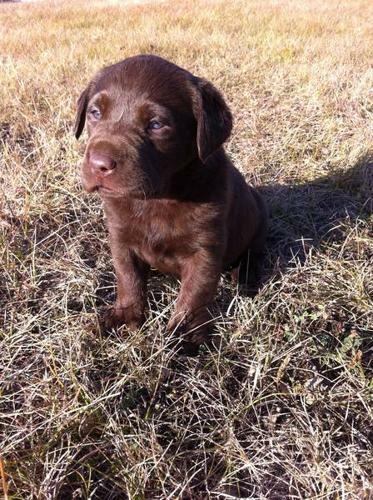 We have 6 beautiful females and 1 handsome male Chocolate Labrador puppies left for sale! Their sire is a CKC registered Chocolate Labrador Retriever (English) and their dam is an unregistered Chocolate Labrador Retriever (American), so the puppies will not be getting registered. Both parents have excellent temperments and are awesome with kids and other animals. They are true to their breed and love the water as well as retrieving! The puppies will be raised in the same loving environment as their parents and will make excellent pets or working dogs. They will have their vet checks, 1st shots, dewormer, and be ready to go by the middle of November. They are getting more cute and playful everyday! If you have any questions or to reserve your puppy please email or call 306-874- or 306-921-. Thanks!